Clivet has helped to provide a cooling and heating solution for a multi-tenant office building which, with a commercial part on the ground floor and the mezzanine floor, is the result of the redevelopment of the former Banco di Sicilia, a historic 1930s Milanese building, adjacent to the Duomo and the Galleria Vittorio Emanuele II. The intervention involved the maintenance and restoration of the external facades characterised by classical architectural elements, the insulation with external coat of the internal court surfaces and the replacement of all the windows and darkening elements. 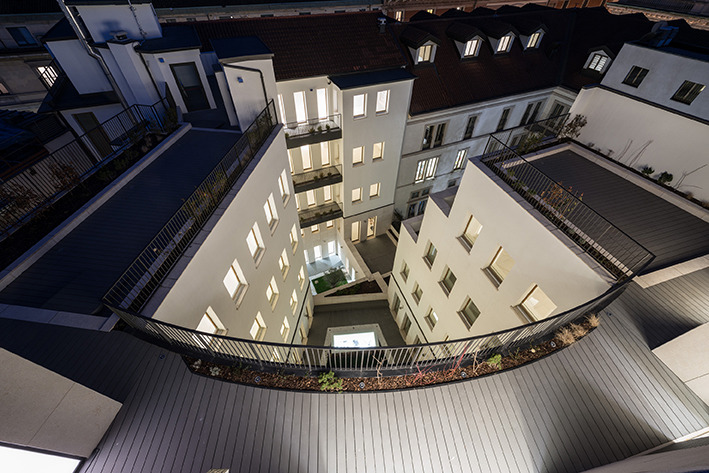 The air conditioning and production of domestic hot water, along with the electrical, fire and safety alarms systems, were replaced, and the internal court yard was valorised with large terraced terraces. The building is made up of three areas, irregularly distributed to create an inner courtyard. The main front is on Via Santa Margherita and the other one on Via Silvio Pellico. The main area on Via Santa Margherita has seven floors above ground while the other on Via Silvio Pellico has six floors above ground. The plant design was supported by the adoption of advanced dynamic energy modelling tools that allowed the team to understand the complex interactions between the parts of the building plant system and optimise the design choices. The main objective for the client was to limit energy consumption and eliminate emissions polluting the internal controlled areas. Clivet also wanted to take advantage of the opportunity offered by the city groundwater, which run at a depth of 35m with a temperature almost constant during the year, which varies between 12-14 degrees Celsius. The property required a building that offered maximum comfort not only in terms of temperature and humidity, but also in air quality, while containing management costs. The entire design and construction had to take place with a ‘green’ perspective, in line with the strict requirements of the LEED Core and Shell protocol. The client also wanted to offer users maximum comfort and maximum autonomy, freedom and flexibility of use. Great importance was given to the flexibility of the systems and structures so that they could be adapted to possible future layout modifications according to the needs of the tenants. 6500 mq offices on seven floors above ground, 1165 mq facade around the internal courtyard, 95 percent recycling of waste produced by the building. The air conditioning is entrusted to an enhanced hydronic system. The heart of the system is the air renewal and purification system, consisting of two full fresh air, air-to-air heat pumps equipped with active thermodynamic energy recovery and electronic air filtration with equivalent efficiency H10. 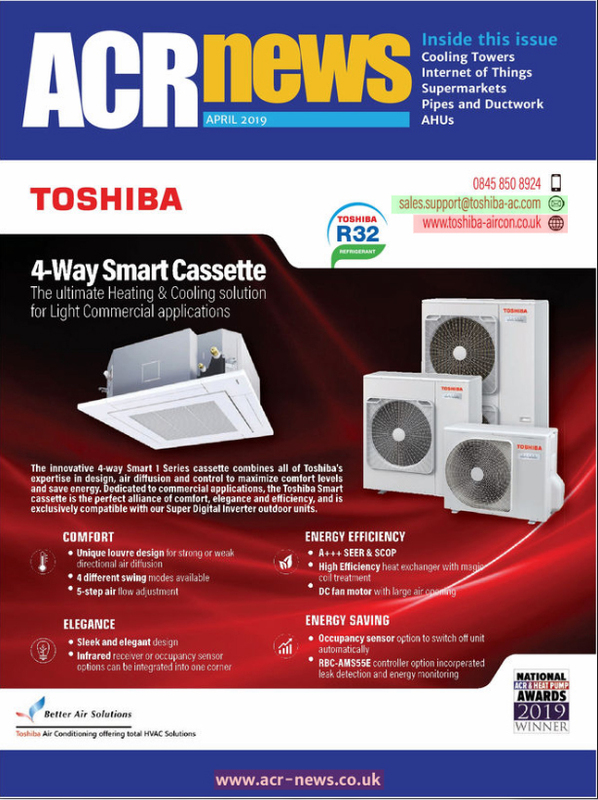 The two Zephir3 units extract and expel the stale air from the rooms and recover the thermal energy, automatically controlling the humidity and the temperature of inlet air through the reversible refrigeration circuit with continuous capacity control, which generates thermal and cooling capacity able to reduce the air renewal load and to contribute to the remaining needs of the served rooms (providing on average an increase of 24 percent of energy that can be deducted from the energy necessary for the air conditioning needs). Two multifunction geothermal heat pumps ELFOEnergy Ground Medium2 MF automatically produce hot, chilled fluid and domestic hot water at the same time. These are energy recovery water-water heat pumps, whose functional switching takes place on the hydraulic circuit and not acting in a complex manner on the refrigeration circuit, thus benefiting the overall reliability of the system. The groundwater is used as an energy source, in full compliance with the requirements of local Authority. Developed to optimise the energy performance of the plant, the Clivet system activates the production of chilled water and hot water on circuits as required. It then establishes whether the secondary fluid (hot in summer and cold in winter) should be recovered in other parts of the plant. For example, it is the case of the heating of non-sunny rooms, or of the preheating of the domestic hot water. Only in case of energy surplus does the automatic valve system activate the exchange with the well. After the exchange with the Clivet system, the water is returned to the ground, to maintain the correct temperature balance of the ground water. The temperature in the rooms is controlled from the hot and cold water from the heat pump.The installation is also equipped with photovoltaic solar panels on the roof. The systems adopted and an integrated plant design and development have allowed the achievement of LEED Core and Shell Platinum certification. The multifunction system that simultaneously produces hot water, chilled water and domestic hot water according to actual requirements, minimising the water drawn from groundwater, combined with the active thermodynamic recovery of Zephir heat pumps for the air renewal, has allowed a reduction in energy consumption and consequently management costs. The enhanced hydronic system, which focuses on the theme of air renewal, a fundamental element in modern, very isolated buildings, has made it possible to optimally meet the air quality requirements, fundamental for the wellbeing of the occupants, as well as the needs of temperature and humidity control. The exploitation of ground water, at a constant temperature of 12- 14 degrees Celsius, has made it possible to further reduce the production costs of hot and chilled water for the air conditioning system. The installation of photovoltaic solar panels has allowed the exploitation of direct solar energy, in addition to the indirect energy used by the heat pumps, for a green building. The type of systems installed is well suited to any future transformation of the interior layout according to tenants needs, as requested by the investor. Leadership in Energy and Environmental Design (LEED) certification, widely used for green buildings, has a special version designed to evaluate the eco-­-compatibility of internal and external building structures: LEED Core and Shell. The LEED Core and Shell standard evaluates buildings according to design and construction criteria. It focuses on the base of the building itself and on the structural elements. The term ‘core’ refers to the structure of the building, while ‘shell’ refers to the exterior. 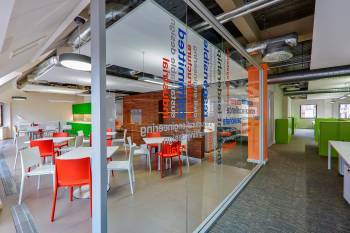 The goal is to make these aspects ecologically optimised and sustainable, in order to provide indirect benefits for interior design and future tenants.